For most of the year, the fields outside the small Kashmiri town of Pampore are dry and barren. Then, with the arrival of the late autumn sun, and amidst the surrounding snow- capped mountains, these fields take on a new life as a sea of tiny lilac flowers sway ever so gently, exuding a sweet aroma into the air. As thousands of villagers gather in the fields with their wicker baskets, their harvest continues to entice and inspire royalty and commoners alike in India and around the world. The crocus sativus is no ordinary flower. Each purple pastel flower is carefully handpicked and all its parts are used. However, its real value is found within its petals–to be precise, in the three red stigmas, the female part of the crocus: saffron. The harvesting of saffron starts once the blooms reach maturity and can only be done at dawn, when the crocus flowers are blooming. To see any reward for their efforts, the Pampore villagers must pluck several hundred thousand flowers. In fact it can take as many as 200,000 flowers just to produce one kilogram of saffron. Extraordinary finesse and eye for detail are crucial skills that every saffron picker must have as each stigma is removed by hand. It is for this reason that saffron is the most expensive herb in the world. The origin of saffron remains uncertain. What is certain, however, is that throughout history saffron has been revered by different cultures for its many beneficial properties. Classic Greeks appreciated its coloring and aphrodisiac qualities, while Imperial Romans used the spice to scent their baths and public halls. In Persia, women used saffron on their faces and bodies for its coloring effect, and in ancient Egypt, Cleopatra and other pharaohs used saffron as a seductive and aromatic essence. Saffron arrived in India thousands of years ago, probably brought by merchants and immigrants through the Central Asian route. Since then Kashmir has been the perfect habitat for the crocus flower to prosper. 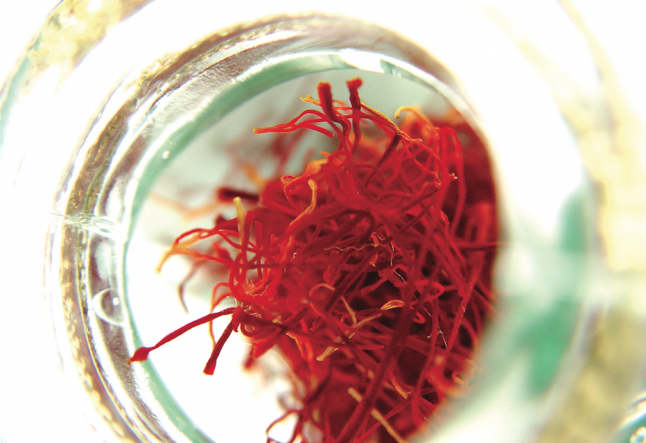 From food and cosmetics to religion and medicine, saffron has for centuries held a special place in Indian culture. In Royal India, where the color produced by soaking saffron filaments in water was considered the very perfection of beauty, saffron was used in the preparation of the most valuable cosmetics. Even today, in traditional Indian wedding ceremonies, the bride’s distinctive glow is created by the gold of saffron paste. The Indian people have had a long-standing fondness of all things gold in everything from ornaments, jewelry to rich golden fabrics in saris and silks. Gold is found abundantly in India. Similarly, saffron is golden, precious and considered auspicious as wearing saffron is a symbol of abundance and pure beauty. Moreover, saffron has a deeply enriching color that creates a cheery and positive energy all around. It may be for this reason that the color is widely present not only in Hinduism, where saffron paste is used both as a mark of piety by worshippers and to anoint all deities in the pantheon, but also in other religions that have branched out from it. Buddhist robes, for example, are dyed in saffron to reflect the monks’ belief that the rich color can help them achieve their goal of moksha or deliverance. Finally, saffron is a prime spice in Ayurveda, where it is considered tridoshic, or balancing for all doshas (vital energies in our bodies) and as such is widely used both in cooking and treatments. Among others, it helps in assimilation of nutrients and dhatu (tissue) formation and in flushing toxins out of the tissues of the body. The ancient Vedic texts extol the virtues of saffron, from its aphrodisiac properties to overall vitality – not surprisingly, saffron is regarded by Ayurveda as a royal spice, a pure expression of beauty, spirituality and equilibrium. So, the next time you are at spice aisle, do not be surprised that you will not find saffron on the shelves. This precious and most expensive herb is often locked behind the checkout stands and only available upon request. Luxuriate in this royal spice and discover the pure beauty of saffron as seen through Ayurveda.